Warm up by hitting 30 or so short and easy wedge shots. Move on to some full short iron shots. Hit some longer iron shots. Go through the different hybrids and fairway woods hitting a variety of shots. Hit my driver less than 10 times in a row and then move back to an iron or wedge. At this point I would simply mix it up, trying to hit a variety of shots that I’d for sure need. It’d go something like…driver…wedge…7-iron…hybrid…driver…3-iron…wedge…wedge…etc. After a full bucket or so, I’d try to spend an equal amount of time putting and chipping. I didn’t have any real schedule, I’d just hit a variety of putts and chips. Boring huh? I’d visualize a well known golf course and “play” it. For example, if at that particular course I’d normally hit driver on the first hole, I’d hit one driver shot at the range. Depending on how well I hit it would determine what club I’d hit next. If I felt like I hit it in the rough or somewhere that might be a rough lie, I’d stomp on the next range ball a bit and try to hit a comparable shot with whatever iron I thought I’d probably need. I’d do this for the entire round (skipping the putts). This felt like good practice for me as it kept me from just hitting ball after ball after ball without actually trying to “hit a shot”. Even though I wasn’t quite good enough to work the ball too much, I started trying to move it around a little bit at the range. Learning to hit a little cut shot was one of the best things I’ve done. I would have never tried it with confidence on the course. 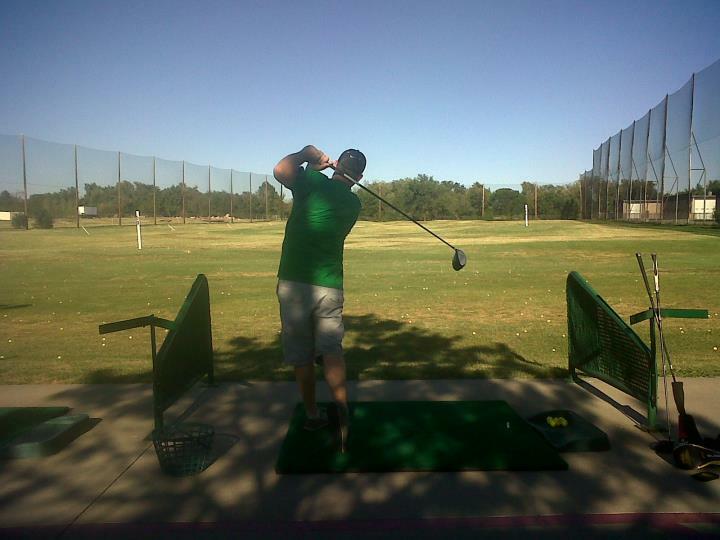 I kept improving it at the range and before I knew it I could do it on the course. I’d also try to hit different trajectories and I’d see if I could accurately take off or add power to certain shots. This was fun and it had a huge impact on my game. One chipping drill I used to do to work on my distance control is I would hit my first shot very short towards my target (I’d leave the ball 20 or 30 feet short of the cup). The next shot I would try to hit further than the first shot, but as close to it as possible. The third shot I would hit further than the second, but as close as possible. And so on. So ideally I’d hit 20 or so shots, with each being just a tiny bit further than the previous. This drill is tough, but I always had fun doing it. I don’t spend nearly as much time at the range as I used to, but any time I do go, I always make sure I try and have fun by doing different things and not just hitting boring shot after boring shot.